Lester Young’s description of how Frank Trumbauer “always told a little story” through his music is the type of quietly stated but philosophically explosive idea that was bound to change everything. Young was probably not the first person to use the term “story.” He was certainly not the first musician to conceive of a jazz solo as a coherent narrative implying something beyond notes and rhythms (though his words, like his music, perfectly express that concept). Whenever the metaphor first appeared or whoever first began “telling stories,” before Young, Trumbauer and maybe even Louis Armstrong, the idea has not only stuck but has become synonymous with jazz improvisation. Solos are often described in terms of their “beginning, climax” and “conclusion.” Even the most diehard free jazz player will mention a desire to “communicate” with the listener. Describing a musician as “just playing notes” often means that their playing lacks something crucial. 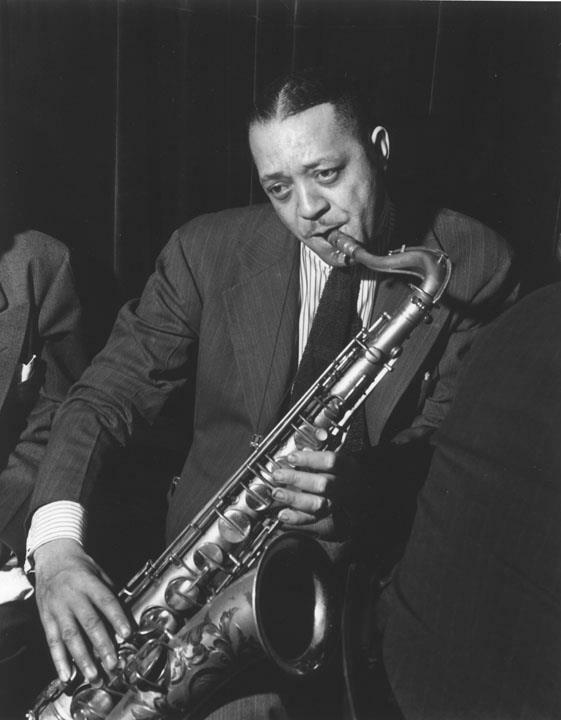 It’s a popular way to dismiss players or entire styles, indicating that whatever else “jazz” means, it is about “saying something.” What young Lester Young described as a new possibility now seems like the only way to play jazz. The analogy between a jazz solo and a story has also inspired enough thought and ink to fill books such as Sven Bjerstedt’s Storytelling In Jazz Improvisation. The Swedish scholar considers and dissects this metaphor using sources ranging from hermeneutic philosopher George Gadamer to the contemporary Swedish jazz scene, across more than three-hundred meticulously cited and often dense (but not impenetrable) pages. Even if you don’t have the inclination to read or the time to finish it, the mere existence of Bjerstedt’s book illustrates the ubiquity and impact of the storytelling metaphor. Ironically, while reading Bjerstedt’s thesis I wasn’t thinking about Young, Armstrong, Coleman Hawkins, Charlie Parker or even Thelonious Monk, John Coltrane, Eric Dolphy and other players considered “storytellers.” Instead, I could not stop playing Bobby Davis’s music. Bobby Davis never led his own date and practically vanished from disographical and historical records after the early thirties, passing away fairly young in 1949. Yet he was prominent as both a soloist and an ensemble player with the California Ramblers in all their pseudonymous glory during the twenties. Eugene Chadbourne’s All Music Guide entry on Davis describes “a brilliant multi-instrumentalist” and Richard Sudhalter credits Davis’s “bright-toned and upbeat” clarinet and alto saxophone at several points in his landmark Lost Chords. Hundreds of sides feature Davis playing an intense, personal style that I would never describe as telling a story. It’s not Davis’s tone, which is actually quite smooth if occasionally (and delightfully) nasal, adding that spiky atmosphere. Nor is it his frequent recourse to broken chords; Davis keeps returning to the top of a new phrase before letting the last one finish, like starting down a new stairway before getting to the bottom of another. If you had to make a literary analogy, it might be to some William S. Burroughs cut and paste outing, but if anything Davis conjures an M.C. Escher landscape reimagined by John Held. Five Birmingham Babies, "Go Back Where You Stayed Last Night"
Davis builds a peculiar, very powerful tension between the written melody and his interpretation of it. This is not the warm, well-wrought approach of Louis Armstrong, who could take his own paring down of a song and make it fit the tune like a glove, or the flurrying personalizations of Coleman Hawkins or Charlie Parker, with those long, twisting runs between phrases that sound like part of the sheet music. It’s also not the wide-open, relentlessly individualistic flights on blank canvas of many free or avant-garde players. There’s an eschewal of story at work in Davis’s playing, that of both the composer and the performer. [Armstrong] rejected the prevailing standard of novelty that encouraged a rambling, disjointed rhetoric in order to provide a more or less constant sense of the unexpected. In its place he substituted a structural conception that later musicians would identify with telling a story. Harker’s elegant summary, also cited by Bjerstedt, places two concepts of a jazz solo next to one another. It’s easy to hear terms such as “rambling” and “disjointed” as pejoratives but worth remembering that we’re hearing those terms long after the other concept won out. It’s no small wonder that the storytelling model of a jazz solo seems like a stretch when applied to Bobby Davis’s music. Instead of coherence, Davis emphasizes variety. Instead of narrative, he works in collage. In place of allusion, he provides non sequitur. Rather than telling a story or drawing a portrait, at most Davis provides a few Rorschach blurs. Either the moldy fig or the contrarian in me (perhaps one and the same) couldn’t stop thinking about Davis’s music while reading Bjerstedt’s thesis. That music comes from before the storytelling model as well as later rejections of it. It’s completely removed from what most jazz musicians and listeners have taken for granted over several decades. There are now several options for Davis’s music, or that of Panico, Don Murray, Buster Bailey, Bill Moore, Woody Walder and others: reduce it to a nostalgic experience, write it off as a misstep on the way to some supposed jazz teleology or explore it as some vestigial limb of jazz. Personally, I just hear another approach to playing a jazz solo. I also hear a refreshing lack of pretense in Davis’s playing. I don’t hear a storyteller, a spontaneous composer, a sensitive artist or a pensive experimenter. There is no story or deep sentiment at work, just pitch, rhythm, harmony, timbre and other sounds, left to their own devices, freed from encumbrances such as dramatic arch and emotional expression, exploding in real time over a danceable beat, never reminding me of anything else, not needing to reference anything but themselves and never taking themselves too seriously. It’s just another way of doing things, even if it doesn’t make a good story. Thank you for writing about Bobby Davis. He deserves more recognition!!! It was my pleasure, and I agree with you. Thank you for so much for reading and for commenting, Harold! Hey Rob, I guess I just don’t think that “making sounds” needs the “just” before it! Thanks for reading and sharing your thoughts, Rob! I am so glad you brought up Bobby Davis, an underrated musician if there is one. I am a great fan. 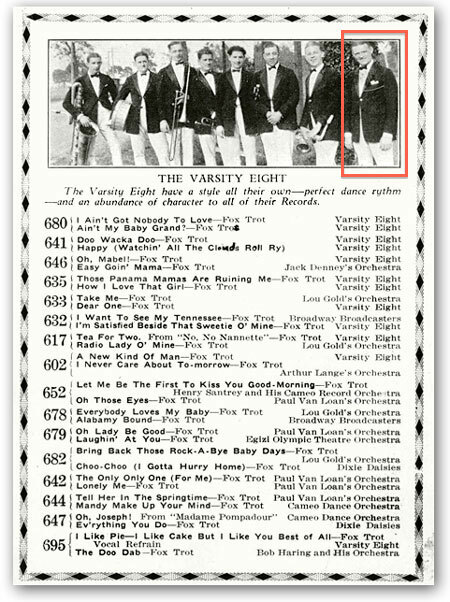 Bix’s cornet solo in the Wolverines’ Riverboat Shufffle was copied by Bobby Davis in his alto sax solo in “She Loves Me” by the High Society Seven (pseudonym for the California Ramblers). John Otto’s astute discovery!! http://bixography.com/SheLovesMeCalRambRob.wma Courtesy of Rob Rothberg. Fascinating stuff Albert, thanks for sharing! Would those of you more familiar with these recordings agree that Davis’s “novelist” approach is more evident on alto sax than in his clarinet performances? Like others, he may have been influenced by Bennie Krueger – sometimes, the particular instrument chosen came with a prevalent style. Hi tronepone. I’ll preface this by saying that I enjoy Davis’s playing and I have spent a fair amount of time with his music, but there are obviously other listeners out there who are far more familiar with the records than I am and who might hear things differently. So for now, unfortunately I’m as “familiar with the recordings” as you’ll get, until others comment! You raise a really interesting point about Krueger’s influence on players of the time. Personally I hear an influence on Davis in terms of tone and a more general concept of the sax as capable of rapid-fire playing. Yet to my ears, Krueger’s up-tempo displays, with their double and triple tonguing, still maintain more of a line and are more rooted in classical/light classical feel; it sounds like a very different execution and aesthetic than that of Davis. Krueger sounds rococo and Davis seems downright modernist next to him. I didn’t cover Davis’s clarinet but enjoy it quite a bit: broad and woody sound in the lower register, cutting and busy in upper register obbligatos and (again, to my ears) at times more sarcastic than his alto sax. Thanks so much for reading and for broadening the discussion! Excellent stuff. A couple of comments. One, I find his conception very cornet-oriented (in the Armstrong direction). Did he express particular admiration for Armstrong? Second, I believe the “storytelling” metaphor for jazz soloing has been overdrawn. When I use the expression story-telling I refer to cohesive bar-to-bar or phrase-to-phrase internal logic, not overall “architectural” shape, which is generally approached as an afterthought, rooted in precedent, not particularly in inventiveness (i.e. “progress”). Think of it like this: Every musician knows that ending a solo a certain kind of way will elicit a certain response from the audience-loud and fast will bring the huzzahs. In the same way, the idea building a solo in intensity from chorus to chorus is an easy “storytelling” marker to use. These kinds of markers may touch and satisfy some human structural (“Storytelling”) need, but is it in any way superior to creative bar to bar or phrase to phrase solo construction? No. And this, I think, is just another way to echo your point of view. I agree that we seem to be on the same page, Steve. For me (a listener), there is no “superior” way to approach solo construction, because I always assumed that was the point of jazz as an idiom that values individuality. One may prefer a particular approach to another but that is not a critical stance. Yet so much early jazz is dismissed according to later, and ultimately subjective, standards. Personally, I just try to avoid the assumption that early jazz musicians didn’t know how to play better and instead try to understand what they are doing. It doesn’t mean I like everything I hear, but I’ve also tried to never make this blog only about what little old me enjoys. Your point about the cornet-orientation is dead-on. Davis’s concept sounds more saxophonistic (sic and patent-pending) to me, compared to some really overtly brass-like players like Larry Binyon, early Benny Waters and even Jimmy Lytell on occasion, but I would like to now relisten with your comments in mind. This point also goes back to approaches: at one point in John Chilton’s biography of Coleman Hawkins, the author discusses early saxophone players who couldn’t make up their mind if they were playing a trumpet or a clarinet. The larger point was of course Hawkins’ introduction of an integrated style for the saxophone, but I couldn’t help but think of the trumpet-style saxophone as its own distinct musical possibility (and it has fascinated me ever since). A slight correction after looking over my notes: I had originally posted “Hard Hearted Hannah” by the Varsity Eight as an example of Davis’s breaks, but I meant to post “She Loves Me,” by the same group. I have made the correction above. Please forgive my synaptic misfire. The alto solo on “Hard Hearted Hannah” is in fact by Arnold Brilhart, with Davis playing clarinet. It’s also another great side from the Ramblers, so enjoy! 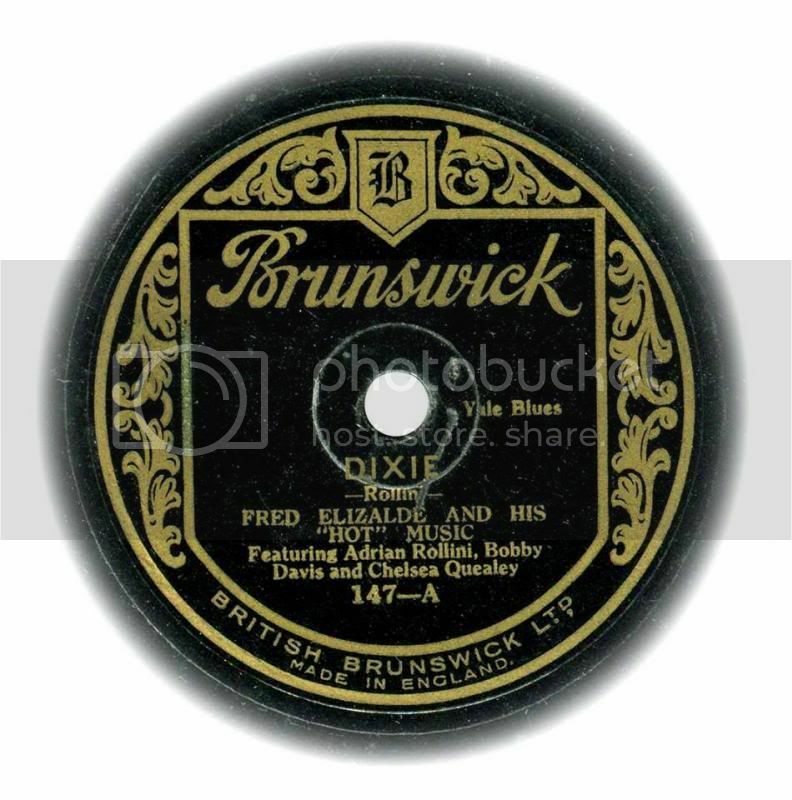 I recall noting a 78 you had of a Rambler’s group quoted a Bix solo too – like to check it, can you send me the title/group/label – thanx! Tiger Rag, California Ramblers as Goldie’s Syncopators, Five Birmingham Babies, etc. I think Rob is referring to another record (since I know I don’t have this one), but nonetheless this is a fantastic performance, in my opinion one of the hottest sides by the full Ramblers complement. Red Nichols quoting Bix Beiderbecke’s solo from his record with the Wolverines is one of the highlights, but the path Nichols takes with the solo, as well as the interaction between Adrian Rollini’s pumping bass sax and Stan King’s swishing cymbals behind him, makes it interesting beyond the homage to Beiderbecke. Thanks for sharing it, Albert!